Until recently, many people thought vaquitas were mythical creatures as few people had ever seen one. Fishing nets have brought these little porpoises to the brink of extinction. There are fewer than 30 left and unless urgent action is taken, they will soon be gone forever. What do vaquitas look like? You’ll know you’re looking at a vaquita if you see a porpoise with a round black patch around his or her eye and black ‘smiling’ lips. Of course, the vaquita isn’t smiling any more than a performing dolphin is, but the shape of their lips makes it look as though they are. Vaquitas have a small, chunky, grey body with paler sides and a white belly. They have a relatively large dorsal fin and people think that this is to help them dissipate heat as they live in much warmer waters than other porpoises. 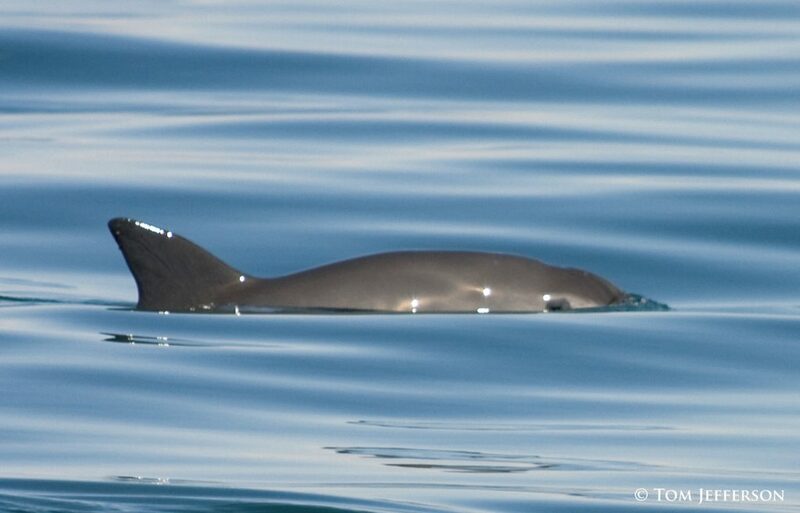 What’s life like for a vaquita? 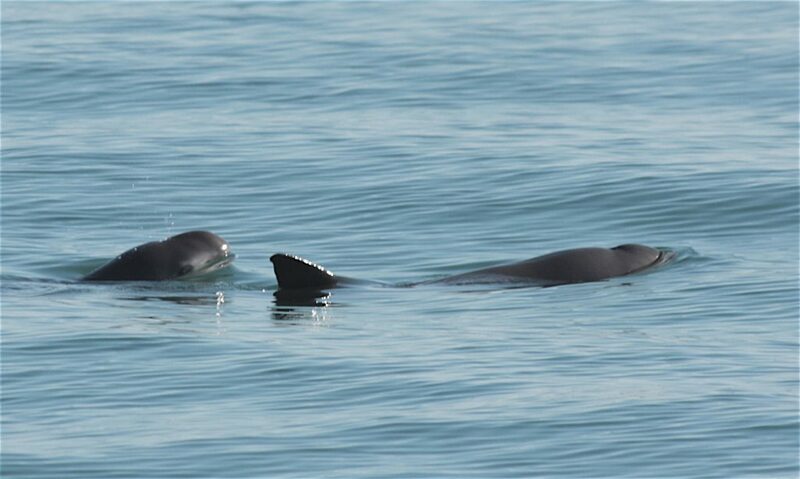 If you are a vaquita, your life is perilous. Although you probably don’t know it, every day you run the risk of stumbling into a fishing net, becoming entangled and suffocating when you can’t get to the surface to breathe. Fishing nets have almost wiped vaquitas out. 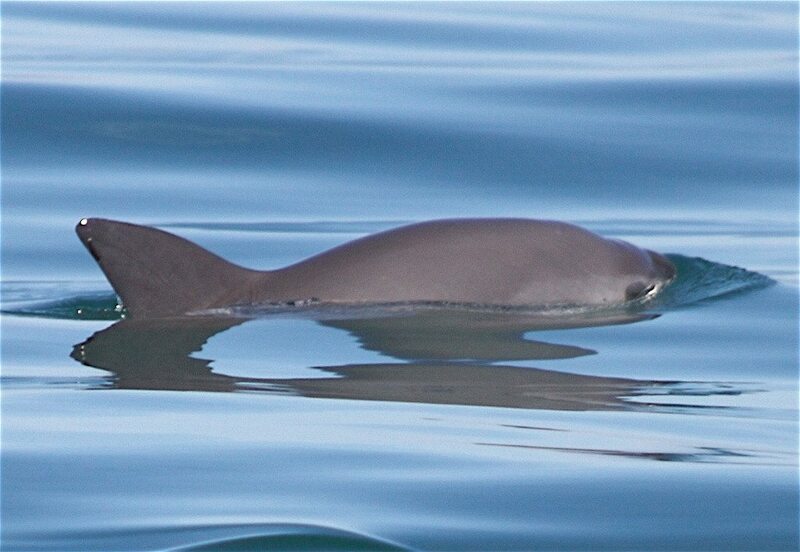 In 1997 there were around 600 vaquitas. Now there are fewer than 30. 90% of the population was lost between 2011 and 2016 alone. 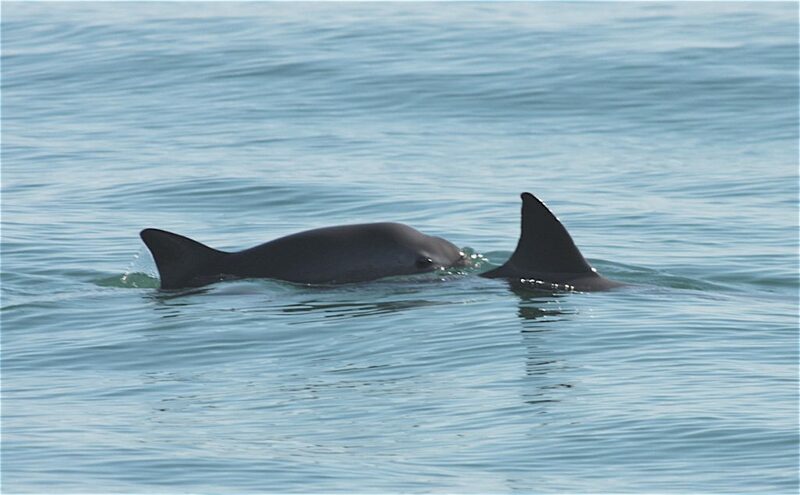 Although the Mexican government has now banned the static nets that were killing them, illegal fishing is still rife in the vaquitas’ home and discarded nets are a massive problem for these little porpoises. Vaquitas enjoy the usual porpoise diet of fish and squid and maybe the odd crab or lobster. When they are hunting, they dive smoothly and surface again slowly. They spend most of their time under the water and so are not often seen by humans. Some scientists think that their unique facial markings play a role in helping them hunt food, which they do using echolocation. This is a technique used by lots of whales, dolphins and porpoises and involves making high pitched clicks that bounce off objects around them. The sound that comes back gives the vaquita information that helps them decide if it’s dinner or not. 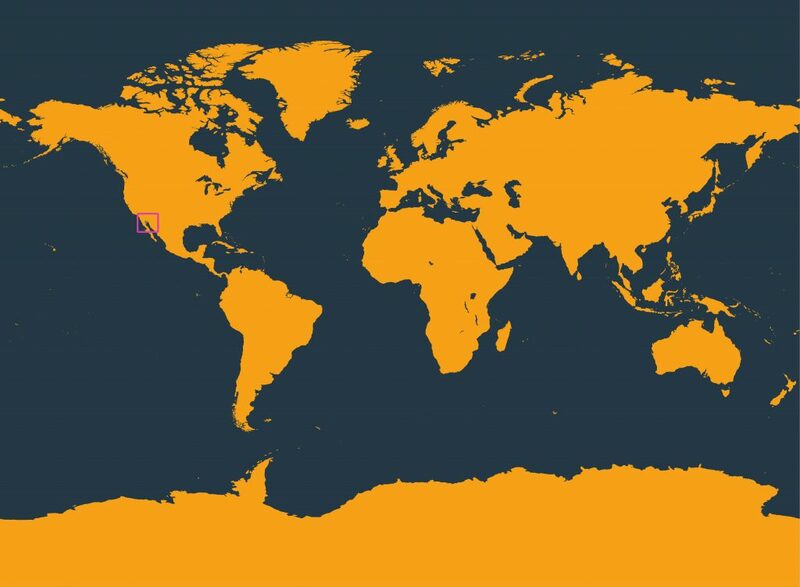 Vaquitas only live in one small area in the north of the Gulf of California (Sea of Cortez), off Mexico. They are not found anywhere else on Earth. The area they call home is just 2,235 square kilometres, although we think they may roam a bit further south along the Mexican coast. They prefer shallow water along the shoreline which puts them right in the danger zone for the illegal fishing nets used to catch another endangered species – the totoaba fish. The demand for the swim bladders of totoaba for Chinese medicine is driving both species to almost certain extinction. Vaquita is Spanish for ‘small cow’ and apparently the word ‘porpoise’ comes from the Latin ‘porcopsicus’ meaning ‘fish pig’. Vaquitas, like their harbour porpoise cousins, make loud noises that sound a bit like pig snorts, and porpoises used to be commonly known as ‘puffing pigs’. Why are vaquitas in such trouble? Gillnets hang in the water like a wall catching everything and everyone that passes. For years, gillnets set to catch shrimp decimated the vaquita population. Like you, vaquitas can’t breathe underwater and so when they get tangled in these nets and can’t get to the surface to breathe, they suffocate. It’s a horrific way to die. Now, the major threat to vaquitas is the illegal fishing of totoaba. These are big fish that are prized for their swim bladder. There’s a massive demand for these from China where it’s smuggled in and sold on the black market for Chinese medicine. 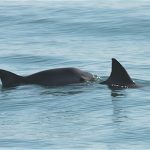 What’s being done to save vaquitas? In April 2015, the Mexican government temporarily banned gillnet fishing in the vaquitas’ home. In 2017, they made this ban permanent along with a ban on night fishing to try to combat the illegal totoaba fishing problem. But the poachers keep fishing and if they don’t stop, they will wipe the vaquita off the face of the planet forever. There was an unsuccessful attempt to move the last vaquitas to a temporary ‘safe habitat’ but this was abandoned after a female vaquita died. 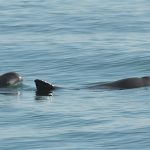 The only way to save them is for the government to stamp out the illegal totoaba poaching and trade and remove all nets from the vaquitas’ home. 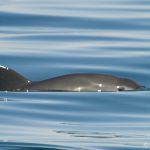 What can I do to save the vaquita? You can write to the Mexican President and ask him to take immediate action to stamp out the illegal totoaba fishing and step up efforts to protect vaquitas. Vaquitas will soon be gone forever if we don’t take action urgently to save them. fishing nets have driven vaquitas to the edge of extinction.